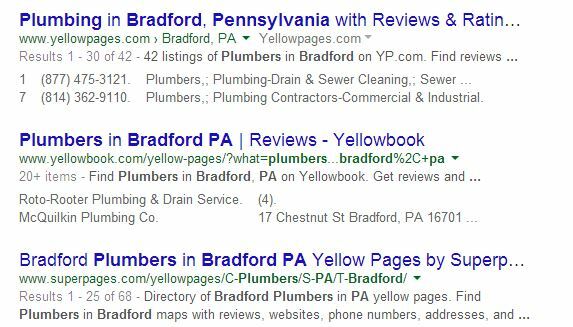 The above image shows the local search results when I search "plumbers bradford pa". These are powered by their Google+ Local business pages. The image below shows the first organic results. Your ranking can be achieved here through proper local optimization. This is a header of a listing on a local directory site. Notice the spelling of "Comfort"...it certainly shouldn't be "CORMFORT". After notifying the 3rd party website of the mistake, weeks after it is still showing. If this were on their own website, this fix could be made immediately. Your local listings in Google are now populated by Google+ local pages. These were formerly Google Places for Business and if you haven't already been converted automatically to Google+ Local, you will be soon. Keep in mind, these listings are different than a Google+ Brand page. At the moment your brand and local pages cannot be merged. If you are a mostly local business, ideally you would use the local page as your main Google+ Business page. To make sure you are showing in these local search results, you must first make sure that you actually have a listing that shows. Go to Google and search for your business using the name of your town, if it shows up in the search results (the local ones) there is probably a link for Google+ page, click that. It should take you to a Google + page and if you scroll down a bit, there is a button that says "Manage This Page", as seen in the screenshot below. A complete business profile is a better business profile. Nobody wants to find inaccurate or missing information. As of right now the Google+ local pages do not support multiple locations, so you'll need to create one of these for each of your brick and mortar locations. Do not just create Google+ local pages for places you want to do business but do not have a physical location, as this would not follow the Google guidelines. Don't stop at just Google. Visit the other local sites in which you can create a profile. This would include things like Bing Places, Yelp, Yahoo, Foursquare, etc. Here is a list from Hubspot of the 50 best local business directories. The list is 2 years old, so a bit has changed, but it is still useful. Keep in mind, the more local business listings you are managing, the more you have to ensure the information on them is accurate. Do what is most applicable to your town. Again, your website is important even if you are on every local business directory that has ever existed. For your website to rank well it has to be structurally sound. Meaning if it was developed 10 years ago using tables, it probably is not in great shape. Ask your developer how they are making your site SEO friendly from a technology perspective. You probably won't know just by looking at it, so reach out for help. If you are curious, we'd be happy to take a look at how the technology behind your website stands in regards to SEO. Make sure that your address and zip code is on your website and easy to find. When you are heavily trying to rank for local, just having it in your footer is probably not enough. Use it in your content, Headings, Page Title, and META Description. Many content management systems will allow you to manage these elements for SEO. DO NOT BE SPAMMY. If you are trying to rank for 50 different towns, don't just list 50 different towns in a paragraph of content. It is more effort than it is worth. It should be used naturally. Create landing pages for your various locations if you have them...it is an easy way to use multiple locations naturally in content and this type of page is useful for a visitor. Again, don't go crazy here by creating 50 landing pages for every small town around you. This again is spammy. Do it for your physical locations and maybe the bigger towns around you, but if you don't have a physical location there, you must make the content useful. Why are you creating a page for a town you don't have a physical location in? Also I have to stress...don't get a fake address for the purposes of ranking. Even if you do end up ranking for a location that doesn't exist, how is this helpful for the customer? If you've read about SEO you probably know the importance of inbound links. An inbound link is when another website is linking to yours in some fashion. A good link goes a long way. Don't purchase or trade links just to do it. Your links should come from very related and authoritative websites. Let's take a real life example. If protocol 80 gets an inbound link from a company that does welding it would not be as related as if we got a link from a company that does graphic design. Additionally you will get little value from a link that is on a page with 500 other links on it. If you can get an in-content link, meaning on a page that has real content, it will go further as well. These links to your site should grow naturally. You can ask for links from friends or partners that are truly related, but don't spam email everyone asking for a link to your website. So you see, doing SEO for local is not all that different from what we would generally suggest...but it is SUPER IMPORTANT! If you are a small business in a small town, your potential customers are searching! You must be in the search results with relevant information if you want to make them actual customers before your competition does.